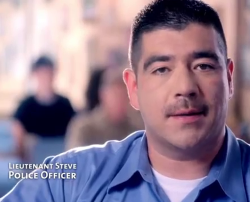 I liked his ad that pretty much claimed his parents died so he could be governor but the newest one, fronted by a police officer, is my new favorite. Lieutenant Steve: I’m a police officer. When John Kasich became governor, he shook things up and upset working people including me. Kaisch’s tough, but I’ve got to admit it he listened. Before Kaisch came in Ohio was a mess. Kaisch cut taxes by $3 billion, tax cuts that helped the middle class. Jobs that were in China and Mexico came back to Ohio. Nearly 250,000 new jobs have been created. Ohio’s coming back. 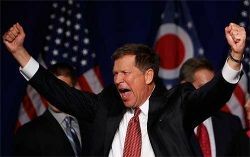 Kaisch’s tough but Kasich works. Upset working people? That is the understatement of the 2014 election season. Back in 2011, he and his GOP buddies wrote and forced through an anti-union bill titled Senate Bill 5 (SB 5) that stripped the right to collective bargaining from public employee unions like police and fire unions. After ignoring massive protests at the statehouse and the largest petition drive in the history of Ohio, Gov. Kasich still had a chance to listen and help repeal the law before it went before the voters. Instead he tried some theater. About 2.1 million voters voted to repeal SB 5. Two million people voted in a non-presidential election year. Yes, working people were upset because Governor Kasich wouldn’t listen. The tax cuts Lieutenant Steve talked about haven’t helped the middle class and especially don’t help public employees like him. Tax cuts led to budget cuts to local government funds many communities use to fund their police and fire departments. The claim about jobs coming back to Ohio is a reach at best. Governor Kasich continues to insist that another income tax cut is what Ohio needs to attract business and create jobs, but the data do not support that. Looking at job growth from February, 2013 to February, 2014, Ohio was outperformed by six of the ten states identified by the conservative Tax Foundation as having the “worst” business tax climates (look no further than high-tax California, which ranked #8 in creating new jobs). It’s clear that tax rates in Ohio are not the only factor holding us back. So, I guess Governor Kasich is tough. 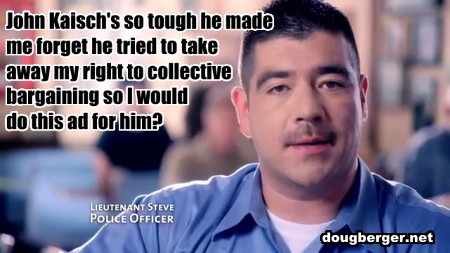 Tough enough to brainwash a police officer.